Just like myelopathy on the neck, thoracic or mid back (upper back) myelopathy occurs when the spinal cord is compressed. This can occur in the mid back for a range of reasons. Technically speaking, myelopathy refers to any condition of the spinal cord. In this article, we are specifically speaking about compressive thoracic myelopathy. These causes above are much less common than discogenic (i.e., intervertebral disc-related degeneration) conditions. In the mid back, the most common form of thoracic myelopathy is compressive. Clinical features are centred about the mechanical compression of the spinal cord. Compressive thoracic myelopathy typically leads to a slow and steady decline in nerve function. 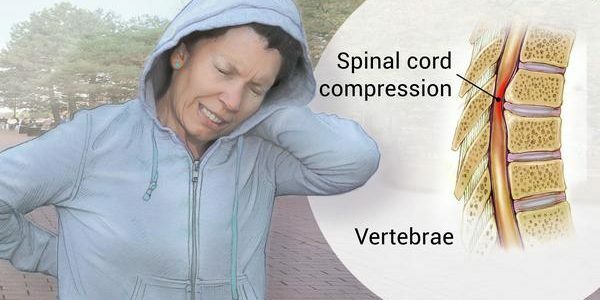 Symptoms typically include, numbness or tingling, weakness in the legs that presents as a loss of coordination or the ability to walk in a straight line. This can progress to complete impairment of the extremities (paraplegia). Myelopathy is primarily diagnosed by clinical exam findings. Because myelopathy is clinical syndrome that can be caused by many pathologies, finding an exact diagnosis can be challenging. The diagnosis depends on the neurological localisation in the spinal cord, rather than the brain or peripheral nervous system. Also, the presence or absence of significant pain or trauma and the mode of onset is important when assessing myelopathy into clinical categories. Once a clinical diagnosis has been made, the underlying cause needs to be investigated. This usually involves medical imaging techniques, such as magnetic resonance imaging (MRI) for assessing pathology of tissues, plain radiographs (i.e., X-rays) for detecting arthritic changes of the bones, and Computer Tomography (CT) that is used for pre-operative planning of surgery. To determine the grade of severity of the myelopathy clinicians use the Nurick classification. The classification is based on abnormalities in the patient’s gait (i.e., walking pattern). This evaluation has demonstrated reasonable sensitivity and validity. At Sydney Spine & Sports Centre (S3C), fixing your back pain is what we have a passion for. However, our chiropractors and physiotherapists cannot fix thoracic myelopathy and you will need a prompt diagnosis and referral for specialist care. Thoracic myelopathy will typically need a spinal surgical intervention know as decompression surgery. There are various decompression procedures that a surgeon may use known as corpectomy and thoracotomy.